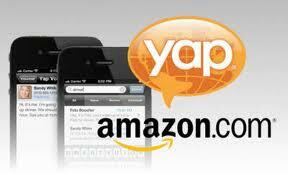 As The Atlantic reports, Amazon’s filings with a Securities and Exchange Commission reveals that the company has acquired speech recognition firm Yap, which may suggests that Amazon is going to compete with Google and Apple on this market. “Though the acquisition was apparently completed in September, no public announcement has been made by either company. The filing does not mention Amazon by name, but Yap merged with a company called "Dion Acquisition Sub" that just so happens to be headquartered at 410 Terry Avenue in Seattle, an Amazon.com building”. Yap had worked on a service for converting voice messages to text and it reportedly owns many objects of intellectual property related to basic voice recognition technology. The company discontinued the consumer voicemail-to-text service on October 20th. Google has integrated speech recognition in some of its products, such as Google Search app for iOS devices. And Apple has entered the market with iPhone’s virtual personal assistant Siri that accepts speech input for retrieving information and performing various tasks. Amazon has for a long time competed with Apple in various digital download markets and is now entering into the mobile hardware market with its Kindle Fire tablet with Android.